Joel Blunk will join with Tom Newton, Belden Lane, the Illuman DC Regional team (formerly MALEs DC Region -- Men As Learners and Elders), and many other returning initiated men to host this area's fourth Men's Rites of Passage at the Buffalo Gap Retreat in Capon Bridge West Virginia, from Wednesday afternoon October 2, 2019 through Sunday afternoon October 6, 2019. This is not just another men's retreat or another spirituality event. Think of this time as jumping, or maybe being thrown, into a "life-changing stew" where you simmer for five days in the "transformational mix" of silence, wilderness, and powerful ritual that holds the possibility of breaking open your heart, allowing you to see new possibilities for yourself, and creating "living questions" that will percolate within you and guide you for years to come. I went on a Men's Rites of Passage in upstate New York in the fall of 2006 with a few friends, joining 102 other guys. I was 59 years old, and life had already initiated me. I didn't really need to be "initiated," so I thought, but I did want to learn how Richard did these remarkable events so that I could "copy" them and start "doing" them at where I was living at Rolling Ridge. Not exactly the frame of mind that I would recommend for coming to one of these occasions. But after the initial obligatory moments of "what in the world am I doing here" and "what have I gotten myself into," I quickly put away my note pad and realized that this was not just something to observe and take notes on, but something to jump into with my whole self. And so I threw myself into the soup. It was an incredible five days that in many ways is still "living" within me. I realized that the deep inner work that began in me that week was not initiated by lecture or words, but by silence in the wilderness and my own struggling to hear more clearly what true new things were longing to be birthed within me. When I returned home and the tumble of life events dimmed the week's imprinting, I still realized that the compassionate presence of other men who "held the space" awakened within me new possibilities and fresh courage to risk one more time and take one more new step, and that something in me was still alive after all these months. In many ways I was still "wandering in the wilderness," but with an open and surrendered heart. We were told three things at the end of the retreat. Don't talk about it too much -- too much talk will freeze frame the experience and stop its growth within you. Create time each day for silence and each month for wilderness. And find a group of men that are asking the same questions and who are hungering for the same thing and begin to work out your life with them. So I didn't talk too much. I struggled each day as the world's crappiest contemplative to find space for silence. I moved to the wilderness. And I did find a group of men. There are now about twelve of us that have been meeting this past year and working with Joel and Steven to prepare a place in the wilderness and in our hearts for you to come and experience this "Rite of Passage." After seventeen years of these life changing Male Initiation Rites, over 5,000 men have now been initiated. We warmly invite you to consider joining this journey with us. We know we need each other, and cannot do this journey alone. And we both need and want you too. We invite you to jump into the fierce boiling of Rumi's life-changing chickpea stew. "Why are you doing this to me?" The cook knocks him down with the ladle. "Don't you try to jump out. You think I'm torturing you. and be the lovely vitality of a human being. Hit me with the skimming spoon. I can't do this by myself." and boiled in the body, two fierce boilings." "My animal soul grew powerful. Our weaver will be Joel Blunk from Richmond, Virginia. Joel has extensive experience working with men through MALES (Men as Learners and Elders) and now as weaver and wisdom elder for the related international men's organization, Illuman. Joel is co-pastoral director of Richmond Hill, an ecumenical residential community in the heart of Richmond, VA, dedicated to prayer, hospitality, racial reconciliation and spiritual development. Joel developed Men4Directions for Oasis Ministries and the Crossings, a young men's rites of passage, in central Pennsylvania. A musician, storyteller, and leader of rites of passage and nature-based experientials intended to nurture wholeness and authenticity, Joel is committed to helping others find that place where their "deep gladness and world's deep hunger meet." Tom Newton will be our ritual elder. Tom has been involved in men’s ministry and men’s spirituality for many years. He formerly served as the Camden Diocesan Director of Men’s Ministry. He has led dozens of Matt Talbot retreats for men in recovery all over the US and North America. He made his Rites of Passage at Ghost Ranch in 2001. Following that transformative experience in his life, Tom served as a Ritual Assistant at six Rites of Passage and has now been a Ritual Elder at two MROPs. Tom believes that his participation in the Rites and his work with Illuman have been some of the most significant experiences in his spiritual journey. Fr. Tom, a Catholic priest of the Diocese of Camden, is also the Pastor of the Catholic Community of Christ Our Light in Cherry Hill, NJ. Tom has a Master of Divinity degree from Christ the King Seminary in East Aurora, NY and a Master of Public Administration degree from Rutgers University. Tom was previously the Vicar for Human Services of the Diocese of Camden. Our Initiator Elder will be Belden Lane from Missouri. Belden C. Lane was Professor of Theological Studies at Saint Louis University, a Presbyterian minister who has taught on a Jesuit, Catholic faculty for 30 years. In addition to being an avid backpacker and storyteller, he has served as an MROP Weaver with MALES and is connected with the Mankind Project in St. Louis. His books include The Solace of Fierce Landscapes: Exploring Desert and Mountain Spirituality (Oxford, 1998), Landscapes of the Sacred (Johns Hopkins, 2001), Ravished by Beauty: The Surprising Legacy of Reformed Spirituality (Oxford, 2011), and Backpacking with Saints: Wilderness Hiking as Spiritual Practice. Five days is a long time. I would have to take off work. Are you sure it's worth it? This is a rare opportunity to spend five days under the guidance and leadership of a remarkable team. Joel Blunk, Tom Newton, and Jim Taylor will be coming as weaver, ritual elder, and initiator to this event. These are experienced initiated men who can help make the "inner path" and the "journey of descent" understandable to beginners. These are men who integrate their own inner life and wisdom spirituality with what is broken in the world and in us. You don't want to miss a week with this team of men, nor a week of October fall weather under the multi-colored tapestry of the canopy of trees at Buffalo Gap Retreat in West Virginia! Tell me again what will happen during the Rites? 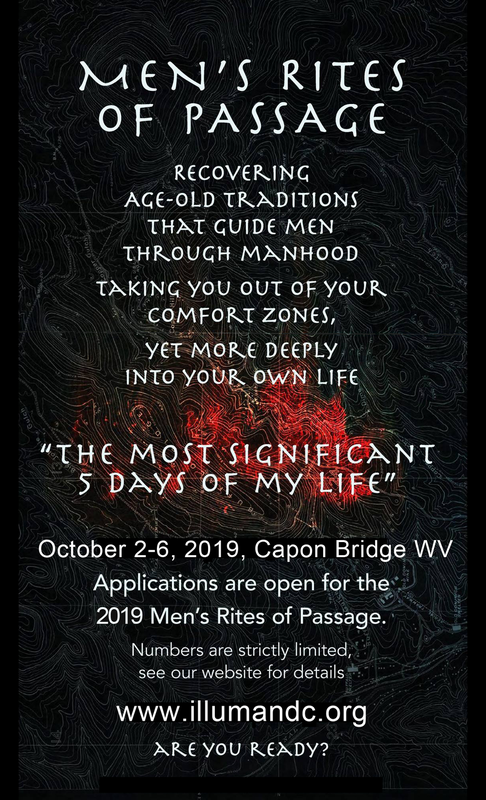 The program is a five-day / four night deeply soulful experience that builds on the classic patterns of male initiation through simple and moving rituals and teaching. Each day includes two "ritual" gatherings, festive common meals, space for silence in the wilderness, and sharing in the context of a "home group." The rites culminate in an extended day alone in the wilderness. You must have a basic mobility and health that allow you to crawl, hike, and fast. In the words of the program's founder, Fr. Richard Rohr: "Men are asked to come with a willingness to participate from beginning to end and not as an observer. All participants begin at point zero with no agendas to live up to or down to. All that is required is for a man to come with a 'beginner's mind' and the readiness of a young novice seeking wisdom. Ultimately, initiation, like life itself, is not a spectator's sport." Can I do this event with my son or with my friend? It is best to make this experience as an individual. Fathers and sons are normally not initiated together, nor is it a buddy experience. You may come with friends, but expect to be assigned to a home group where you will be anonymous and start from zero together. What are the steps to take for signing up for the Rites of Passage? The Rites of Passage is not just another event to attend, nor is it something to "fix" some condition in your life. It is a decision that should come out of a deep place in your life. You should know in your "gut" that you are being invited into this. An application process is required. This kind of event is not for everybody, and we take care in making sure that it is something that you can profit from. So you can't just sign up for the Rites, but must submit an application to attend. This allows a thoughtful discernment process about readiness for the event. So when you feel ready, thoughtfully fill out the Online Application. Please take your time in filling out the questions. With your completed application, use the online payment processing to pay your $100 deposit, or mail it to the address in the online application. If accepted, the deposit becomes non-refundable and is applicable to the final payment. If not accepted, your deposit will be refunded. You will be notified that your application has been received, and then re-notified if you have been accepted, not accepted, or placed on a waiting list. If accepted, a full confirmation packet will be sent to you with event instructions. This event will likely fill up quickly. Don't wait, only to later discover that you are on the waiting list. Click here for the Online Application. The cost of the Rites is $500.00 which includes all lodging, meals, and all materials. Register BEFORE and complete payment BEFORE June 30, 2019 to get an early registration discount of $50. A deposit of $100 is due with your application. he deposit will be returned if you are not accepted. The deposit is non-refundable if you are accepted, and the balance due by September 1, 2019. For those requiring financial assistance in order to participate, we offer a limited number of scholarships covering up to one half of the retreat fee. You can use our online scholarship application or contact Ken Bevin to to talk personally about your financial situation (410-202-6890 or bevank@msn.com). You can make your deposit online using secure PayPal credit card processing or by check made out to DC MALEs in the amount of $100 and sent to DC MALEs, 7069 Saddle Drive, Sikesville MD 21784. Where will the event be held and what are the facilities like? The event will be held at the Buffalo Gap Retreat near Capon Bridge, West Virginia. We have access to eight 4-10 men cabins that can sleep a total of 58, 3 camp sites along a mountain stream that are set up for 33 men who bring their own tents, a large dining hall, and a wood-fired sauna near a swimming pond. Our communal ritual gatherings will be held under a large outdoor tent or pavilion. We have access to hundreds acres of mountain wilderness, with miles of hiking trails and mountain streams. I would like to read more about the event? Where can I find more information? Books and DVDs can provide valuable and should give you an idea if what the Rites offer and what you are seeking are a fit. Check out the resources on this web site. In particular, look at Male Spirituality and Why Men Need Initiation, From Wild Man to Wise Men: Reflections on Male Spirituality, or Adam's Return: The Five Promises of Male Initiation. Also be sure to check out the web site for the Center for Action and Contemplation and the national Illuman web site -- formerly Men As Learners and Elders (MALEs). I would like to talk to someone who has attended the event. I am not sure I am a Christian and I don't want to come if this is just another religious thing. Richard Rohr is Franciscan and Catholic, and much of his work has been to integrate universal wisdom traditions with his own Christian framework. While the images and rituals used in the Rites may draw from many traditions, we are not apologetic about the Christian world-view from which these Rites emerged. You don't need to be scared about this "open-hearted" kind of Christianity. It embraces all faith traditions. The Rites of Passage are not about religion, but about inner spirituality and ancient wisdom traditions that guide us into our truerselves and show us that we can trust that there is something much greater at work in our lives than we could ever imagine. Am I too young, or too old to come? There is no easy answer to this question. This is not for teenagers, or a male initiation event for a young man. And an older man with some health problems may find the wilderness experiences too challenging. Most of the men who have come to the Rites are between 30 and 65. But some younger men have grown up quickly and have already been initiated into the questions and perplexities of the second half of life, and there are many robust men well past 65 who could profit from this time. I'm gay. Will I be welcome? All men are welcome in this sacred and safe space, to speak their truth and discern their paths. We all bring our own insights, anxieties and fears into this kind of intimate, shared experience. In the end, participants will likely find that we are more alike in our longing, our hungers, our deepest aspirations, than we are different. An informational workshop about men's spirituality. A sensitivity training or deprivation experience. A threatening process that requires participants to engage in anything strange or unsafe. A test of physical stamina. A personal discovery about masculine spirituality and "the Holy Mystery." A time to savor the healing and awesome power of nature. A process to address issues of loss, grief, broken relationships and broken dreams. An opportunity to examine life's priorities and ask courageous questions about your next step. An invitation to listen to your own deepest truth and the quiet voice of God. A chance to return to life with a renewed commitment to your gifts.